Dr. Williamson, a native of Baton Rouge, Louisiana, is a graduate of Louisiana State University School of Medicine. He completed his residency in ophthalmology at the University of Alabama in Birmingham. 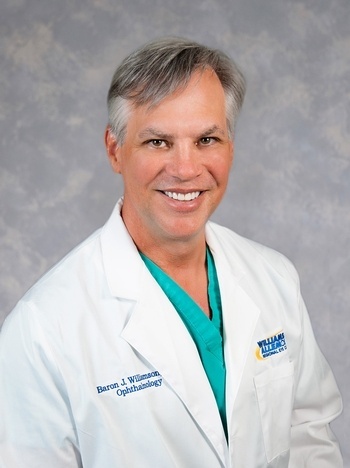 Dr. Williamson is a board certified ophthalmologist and cosmetic surgeon specializing in plastic and reconstructive surgery of the eyelids, eyebrows and face. He is the founder of one of the first centers in the United States devoted exclusively to cosmetic laser surgery, and he has pioneered the use of the CO2 Laser for eyelid surgery and laser skin resurfacing. Dr. Williamson has been Louisiana's leading provider of Botox and popularized the Weekend Neck Lift procedure. In addition he has performed thousands of cataract surgeries specializing in the Lifestyle Improvement Lenses. He is well-known for his management of eye disease, including glaucoma and diabetic retinopathy. Dr. Williamson has written numerous articles, lectured extensively and served as a medical consultant for the laser industry, training physicians from around the world in state-of-the-art laser techniques.